This healthful and comforting vegetarian casserole is perfect on a cool night or any time of year when you want to remember clear, brisk October evenings. Make It a Meal: Enjoy with a glass of Zinfandel and for dessert, biscotti dipped in a fresh-brewed cup of coffee. Preheat oven to 450 degree F. Coat a 9-by-13-inch baking dish with cooking spray. Heat oil in a large nonstick skillet over medium-high heat. Add eggplant, zucchini, salt and pepper and cook, stirring occasionally, until the vegetables are tender and just beginning to brown, 4 to 6 minutes. Add water and spinach; cover and cook until wilted, stirring once, about 3 minutes. Stir marinara sauce into the vegetables and heat through, 1 to 2 minutes. Remove from the heat and stir in basil. Place polenta slices in a single layer in the prepared baking dish, trimming to fit if necessary. 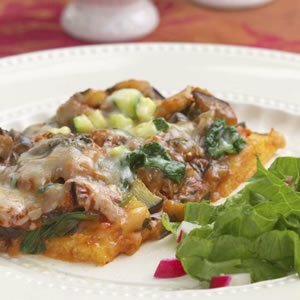 Sprinkle with 3/4 cup cheese, top with the eggplant mixture and sprinkle with the remaining 3/4 cup cheese. Bake until bubbling and the cheese has just melted, 12 to 15 minutes. Let stand for about 5 minutes before serving. Disclaimers: Scaling Disclaimer: EatingWell recipes are tested extensively in the EatingWell Test Kitchen. EatingWell cannot guarantee a recipe that has been scaled to make a different number of servings from the original. Also note that scaling only applies to the ingredient measurements: no adjustment is made to the recipe instructions, so pan sizes and cooking times and ingredient amounts referred to in the text of the recipe only apply to the original number of servings. Gluten-Free Disclaimer: Our nutritionists have verified that the recipes marked as gluten-free do not contain wheat, rye, barley or oats. However, many processed foods, such as broths, soy sauce and other condiments, may contain hidden sources of gluten. If a recipe calls for a packaged (e.g., canned) ingredient, we recommend that you carefully read the label to make sure you pick a brand that does not contain a hidden source of gluten. Also, please note that while a recipe may be marked as “gluten-free,” the serving suggestions that accompany it may contain gluten.